Shape (In Possesion) ** This is not an exercise. Players are encouraged to go High, Wide, and Deep in their postions. The two defensive players give us our depth, the wide players our width, and our striker gives us our height. The two central midfielders create the low and high triangles. Making the field look bigger when we are on possesion will help give the players time on the ball. 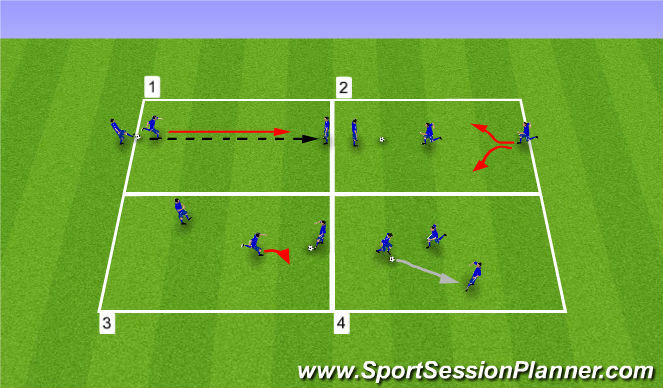 It creates space which will help them to make smart decisions with the ball at their feet. Out of possesion, our job as players is to make the field small for the other team. When we force ourselves into a tight shape and press the ball, it is likely that the other team will panic, thus leading to error. Staying in our formation of 2-1-3-1, we condense ourselves into roughly a 20x20 box. 20x20 box. We stay in this shape, and we press the opposition player that as the ball. Note: By staying in this shape while pressing, we eliminate the idea of players swarming the ball. The purpose of this shape is to make sure that we force players on the opposition wide and away from our goal. We need to get into this shape within 3-6 seconds of giving up the ball. 28x35 Field with 2 x 10x10 squares set up on each half. 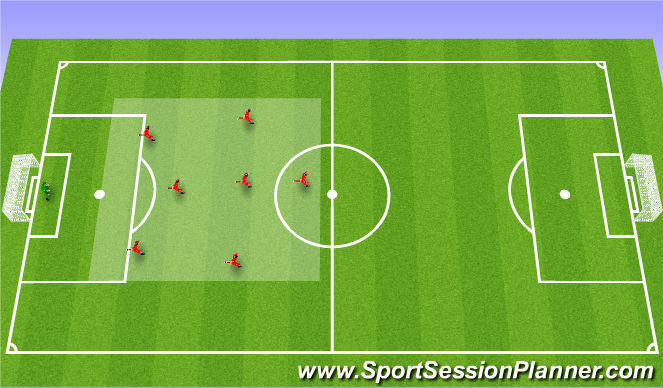 If the team in possesion score, miss, or pass the ball to a player from the opposition team, they then have to return into their area and adopt a good shape. 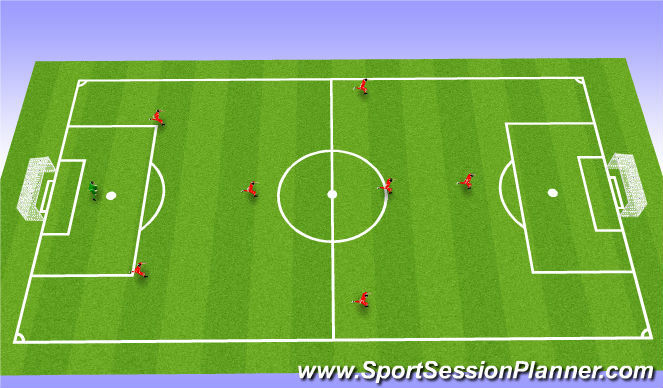 Transition into Defense: They have 6 seconds to get into their area and adopt a good shape. If succesful, they receive a point. Transition into Attack: Every player on the team must touch the ball AT LEAST once before they score. If they can score on the defending team before they are in their shape, then the attacking team gets a poing. Groups of 3 (Depending on Numbers). One ball per group. We will work on a 1v2 Defensive strategy called forcing into pressure. One player will play as an attacker and the other to will defend. Players will rotate each time. 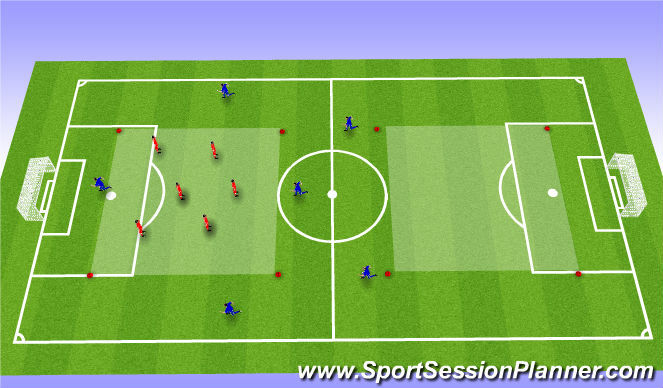 1 The Second defender will pass a ball to the other side of the grid to the attacker. The First defender will rush to close down the attacker. We call this player the first defender because they are the ones to reach the ball first. The Second defender is where we will try and force the attacker. 2 As the First Defender is closing down the attacker, the Second Defender will either yell out, "FORCE LEFT!" or "FORCE RIGHT". The Second Defender will then take up the position that she had yelled out, either left or right. 3 The First Defender will then take up the position opposite to what the Second Defender is doing, thus forcing the attacker to go in the direction on the Second Defender. 4 The players engage in the 1v2. 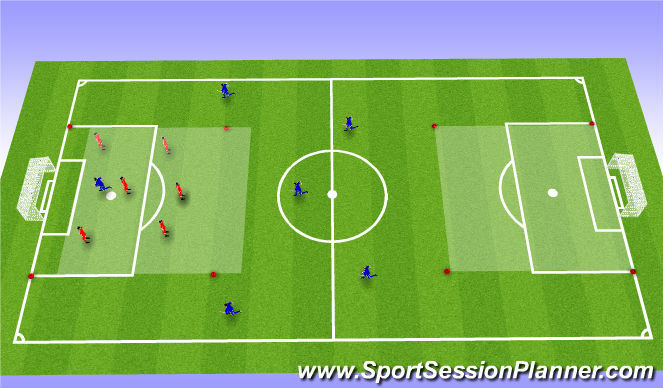 If the defenders win the ball, or the ball goes out of bounds, or the attacker dribbles to the other side of the grid, then the play will stop and the players will rotate positions. Our Objective for this exercise is to encourage communication and an understanding of how to defend as a unit, rather than having everything on a individual focus. Exact same as SSG 1. Exact same as SSG 1. EXCEPT we will move the areas back to infront of the goal. A yard or two away from te pugg goal. Game play is almost the exact same as the SSG 1, EXCEPT the defending team is now allowed to move inside their restriction zone whilst making sure that they maintain their shape. After 5/10 Minutes, take away the restrictions and let them play.